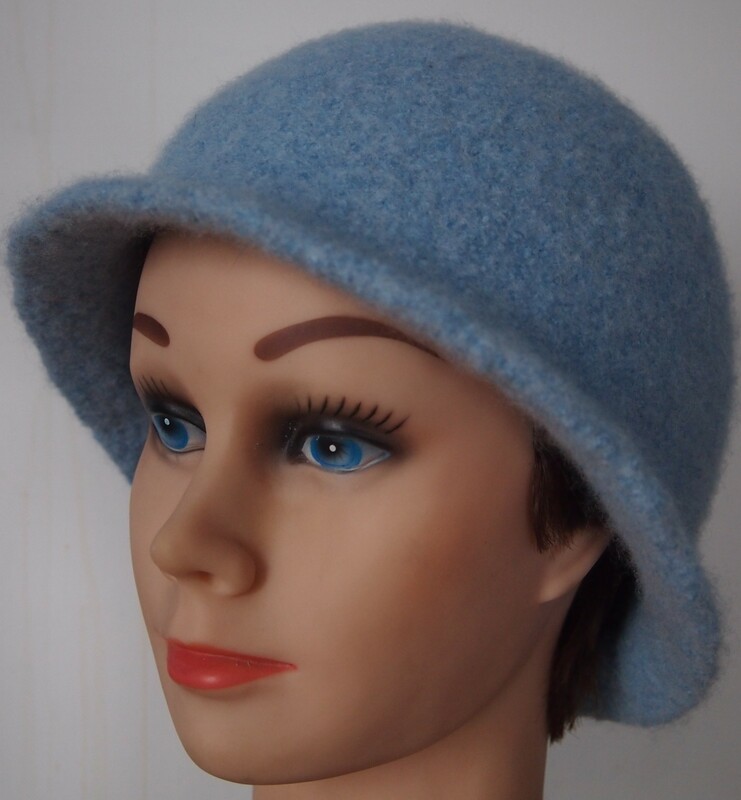 I decided to work out how to do a bit of a brim on a basic felted hat shape. This hat could probably be used as a base for decoration like the pillbox, but I am showing it plain first. Brim: Cast on 200 stitches, I worked the brim in garter stitch…knit one round, purl one round, decreasing was done on every other knit round (4th, 8th, 12th,16th and 20th rounds). There were 10 stitches decreased evenly around on each of the 5 decrease rounds, and the decreases were staggered each time. Body: When you down to 150 stitches, continue in stocking stitch (knit every round) until work measures 9 1/2″ (24 cm) from the beginning. Top: Next round *knit 27, slip 1, k2 tog, psso* repeat around (this will dec 10 stitches around). Knit 2 rounds plain. *knit 25, slip 1, k2 tog, psso* repeat around. Knit 2 rounds plain….continue in this manner doing the decreases with two plain rounds between until after the row with *knit 15, slip 1 k2 tog, psso* at this point start putting only one plain round between until the round with *knit 3, slip 1 k2 tog, psso* after this round, keep knitting 2 together constantly until you have 7 stitches left. Break your yarn and pull it through. Run a string round the point at which the brim meets the body of the hat. Pull it to the correct diameter for your head and tie with a reef knot. Send the hat through the washer, dryer, and washer with laundry. Dry on a form. This entry was posted in felting and tagged felted hat, felting, knitted hat, knitting, Knitting and Crochet, Patons Classic Wool on February 9, 2014 by gillianknitter. This one I’m going to try. My head has been cold this winter and I think I’m going to have to give in and wear a hat. I really like this one.